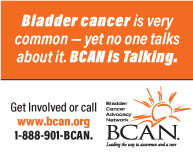 Bladder Cancer is an international multidisciplinary journal to facilitate progress in understanding the epidemiology/etiology, genetics, molecular correlates, pathogenesis, pharmacology, ethics, patient advocacy and survivorship, diagnosis and treatment of tumors of the bladder and upper urinary tract. The journal publishes research reports, reviews, short communications, and letters-to-the-editor. In addition, the journal will also have a “News and Views” section for timely commentary. The journal is dedicated to providing an open forum for original research in basic science, translational research and clinical medicine that will expedite our fundamental understanding and improve treatment of tumors of the bladder and upper urinary tract.